New lower-denomination Swiss stamps were first issued in 1882, replacing the perforated Sitting Helvetia definitive postage stamp types of 1862-1881. These new stamps are referred to by Swiss philatelists as the "Kreuz und Wertziffer" or "Cross and Numeral" Series. This series is much more simple to understand than the concurrent Standing Helvetia series of higher-denomination definitive postage stamps, as only ONE perforation gauge was used over the entire lifetime of this Cross and Numeral series. The different issues described in this page are presented in Zumstein catalog order. I personally find this listing format very logical and easy to understand. The Michel listings are excruciatingly precise, but they can be confusing. The so-called cross-in-oval watermark is NOT ACTUALLY A PAPER WATERMARK at all! The cross-in-oval was impressed into the paper, as a control mark, after its manufacture. Two types of the cross-in-oval control mark were used. Type I - This control mark was used from 1862 through 1892. On this type, the oval is 8.9 mm wide at its widest point. The branches of the cross are thicker, and the double lines of the oval are fairly wide apart. Type II - This control mark was used from 1894 though 1904, when it was abandoned in favor of paper containing the Swiss Cross watermark. On this type, the oval is 8.4 mm wide at its widest point. The branches of the cross are thinner, and the double lines of the oval are very close to each other. The five Cross and Numeral type definitive stamps shown above were issued on April 1, 1882. These new Swiss stamps are printed on white, wove paper, with the Cross-in-Oval control mark Type II. 02 C. (1882 - Type II - Zu. #53, Mi. #45, Sc. #77) - Olive Brown. 05 C. (1882 - Type II - Zu. #54, Mi. #46, Sc. #78) - Brown Lilac. 10 C. (1882 - Type II - Zu. #55, Mi. #47, Sc. #79) - Rose. 12 C. (1882 - Type II - Zu. #56, Mi. #48, Sc. #80) - Ultramarine. 15 C. (1882 - Type II - Zu. #57, Mi. #49, Sc. #81) - Yellow. The seven Cross and Numeral type definitive stamps shown above were issued between April 1882 and December 1889. These new Swiss stamps are printed on granite paper, with the Cross-in-Oval control mark Type I. 02 C. (1882 - Type I - Zu. #58A, Mi. #50X, Sc. #69a) - Olive Brown. 03 C. (1882 - Type I - Zu. #59A, Mi. #51X, Sc. #70b) - Gray. 05 C. (1882 - Type I - Zu. #60A, Mi. #52X, Sc. #71b) - Brown Lilac. 10 C. (1882 - Type I - Zu. #61A, Mi. #54X, Sc. #73a) - Carmine, Rose, Carmine Rose. 12 C. (1882 - Type I - Zu. #62A, Mi. #55X, Sc. #74c) - Ultramarine. 15 C. (1882 - Type I - Zu. #63A, Mi. #56X, Sc. #75) - Yellow, Yellow Orange, Orange. 15 C. (1889 - Type I - Zu. #64A, Mi. #57X, Sc. #76b) - Purple. 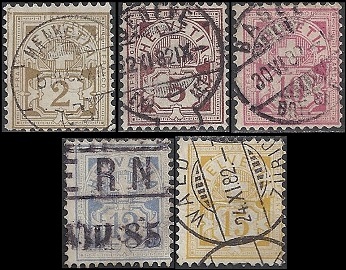 Six of the seven Cross and Numeral type definitive stamps shown in the scan directly above were re-issued in 1894. 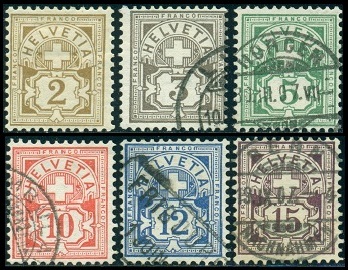 These re-issued Swiss stamps are printed on granite paper, with the Cross-in-Oval control mark Type II. 02 C. (1894 - Type II - Zu. #58B, Mi. #50Y, Sc. #69) - Olive Brown. 03 C. (1894 - Type II - Zu. #59B, Mi. #51Y, Sc. #70) - Gray. 05 C. (1894 - Type II - Zu. #60B, Mi. #52Y, Sc. #71) - Brown Lilac. 10 C. (1894 - Type II - Zu. #61B, Mi. #54Y, Sc. #73) - Vermilion. 12 C. (1894 - Type II - Zu. #62B, Mi. #55Y, Sc. #74) - Ultramarine, Blue. 15 C. (1894 - Type II - Zu. #64B, Mi. #57Y, Sc. #76) - Lilac, Brown Lilac. The 5 C. denomination stamp shown above was printed in green, beginning in 1899. 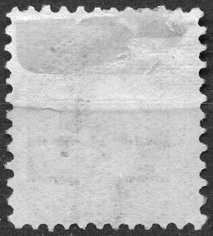 This stamp is printed on granite paper, with the Cross-in-Oval control mark Type II. 05 C. (1899 - Type II - Zu. #65B, Mi. #53Y, Sc. #72) - Green. During 1905, a new granite paper containing a Swiss Cross watermark was introduced, and all Swiss postage stamps have been printed on paper with this watermark since then. The new watermark is shown in the image above. The six Cross and Numeral type definitive stamps shown above were issued during August 1906. 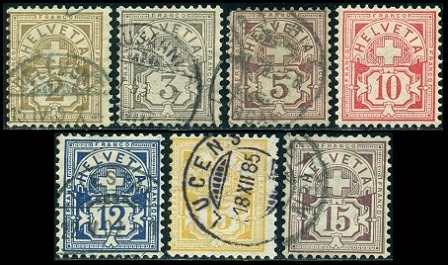 These Swiss stamps are printed on granite paper, with the Swiss Cross watermark. 02 C. (1906 - Zu. #80, Mi. #82, Sc. #113) - Olive Brown. 03 C. (1906 - Zu. #81, Mi. #83, Sc. #114) - Brownish Gray. 05 C. (1906 - Zu. #82, Mi. #84, Sc. #115) - Green. 10 C. (1906 - Zu. #83, Mi. #85, Sc. #116) - Vermilion, Red. 12 C. (1906 - Zu. #84, Mi. #86, Sc. #117) - Ultramarine. 15 C. (1906 - Zu. #85, Mi. #87, Sc. #118) - Brown Lilac.